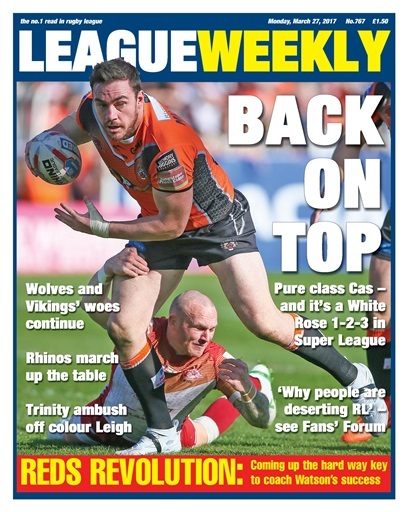 It's a White Rose 1-2-3 at the top of Super League after Castleford hit form again in style, and Hull edged a nervy win over depleted Wigan. Warrington and WIdnes's woes continue at the other end of the table, while Leigh fell apart against Wakefield when in a winning position. We have Vossy on the NRL's $10 million man Jason Taumalolo, plus hard hitting comment from Danny Lockwood and wonderful musings from top scribe Dave Hadfield. Nosey Parker brings all the gossip while Salford coach Ian Watson reveals the secret to his coaching success. And as ever there's every match report, stat, and much much more. 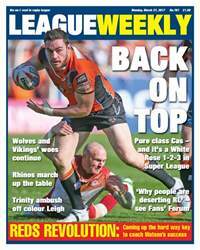 League's no.1 read – League Weekly.